I just returned from one of my guild’s retreats. Also know as a getaway. And even referred to as a runaway…no dishes, cleaning, laundry! 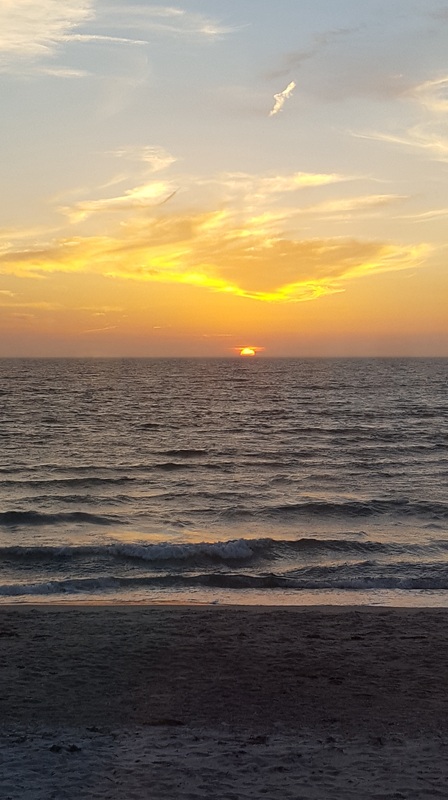 One wonderful dinner was included and look at that sunset we got to enjoy on Cape Cod! Falmouth, MA…on “the Cape”… Cape Cod! I have posted about retreats/getaways before, but this time I want to share a couple tips about the prep work I did. I took the time to pre cut as much as I could before I left. This gave me a chance to sit and sew, sew, SEW! No thinking, just sewing and talking to my quilting friends. The first day I layed out and pieced this cute “plus sign” quilt. Or “t” or “cross”. Or if you put it on point, it could be an “x”. Completely made from 5″ squares, fondly known as charms. Below is another quilt I worked on. It is from a class “Kickin’ Stash”, same name as the pattern, I took from Beth Helfter of “Eva Paige Designs”. (YES, I still take classes even though I teach! It is always fun to be a student.). Beth is a fun teacher and “made” us try two different ways of making these blocks scrappy, random and controlled. 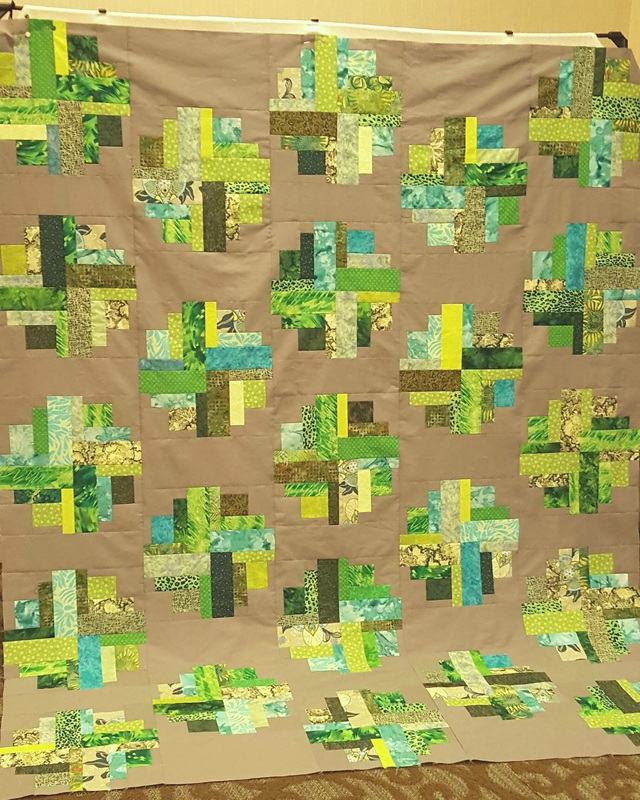 Can you find the one “controlled block” that only has four fabrics plus the background? (It is not the bottom right corner that got cut off in the photo). I definitely liked the totally scrappy better, but it was a good exercise. Yes, you can see I included it in the quilt with the others, why not?! I only had 10 blocks made when I got to the getaway. I had 10 more to finish. I layed it out and decided to change the layout a bit. This required 3 more blocks. Good thing I packed all the extra fabrics I had used for this project. (Still in the plastic bin I started with). But, I was using up scraps and started running out of some I used in the beginning. So, the last three blocks I made aren’t as scrappy. Can you tell? I really can’t in the overall look. This quilt is called “Fried Green Tomatoes “. 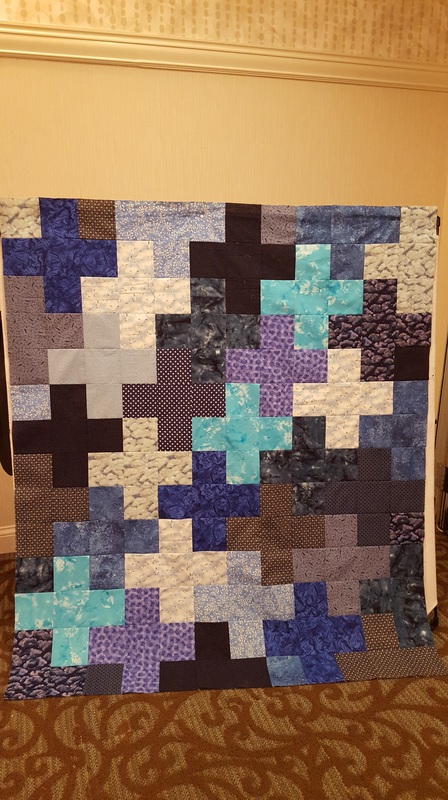 It was going to be my challenge quilt last year that didn’t get finished in time. The challenge was to use gray and the color in a movie title. The title…”Fried Green Tomatoes”!! #2- Sometimes plan B requires more fabric. Be prepared when working on projects away from your stash. In laying out both of these quilts I used a portable design wall. We are not allowed to pin or tape things to the walls, understandable! 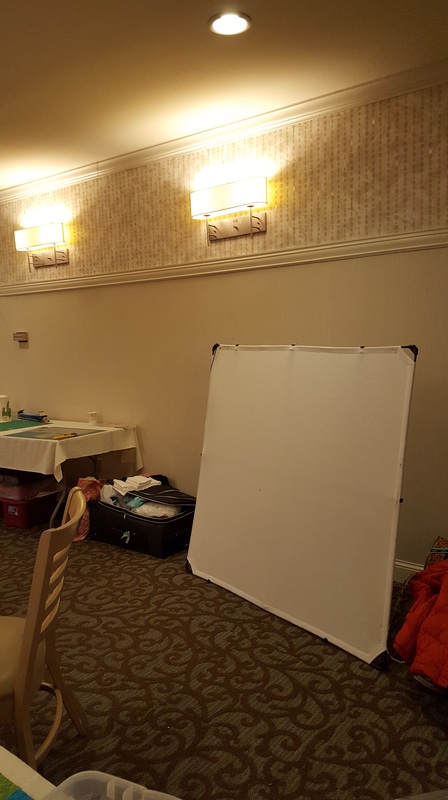 I usually use a piece of foam sheeting insulation for my design wall, but it is awkward to travel with. Cheryl Ann’s Deaign Wall works well. Careful not to pinch your fingers snapping it together. It is a tight fit. 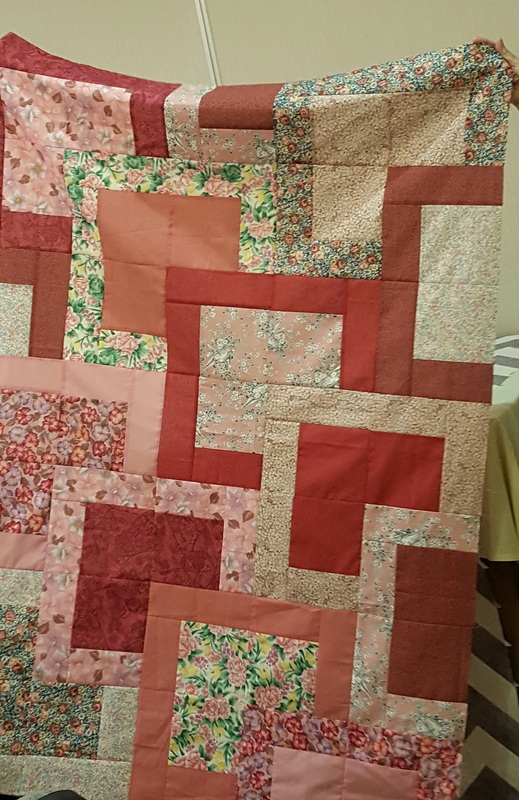 The cherry on top for the weekend….one of the girls made my “Done by Three” pattern, in pink! Sweet! Good work Lucille! This entry was posted in Design wall, Tips, Uncategorized. Bookmark the permalink.